We can't trust that woman to do anything right. We have been reading about Blogoversarys and 100 posts and gotcha days and birthdays and realized: MOM MISSES EVERYTHING!!! So, we are going to mess with her. In celebration of the New Year, we are going to host a commentathon. We know we don't get too many visitors here, so we are hoping our loyal followers will pass the word on and maybe we can meet some new kitties, doggies and peoples. For our commentathon, we are gonna make mom donate $.25 per comment to Citizens for Humane Action which is where mom is currently volunteering. So hop to it people!!! 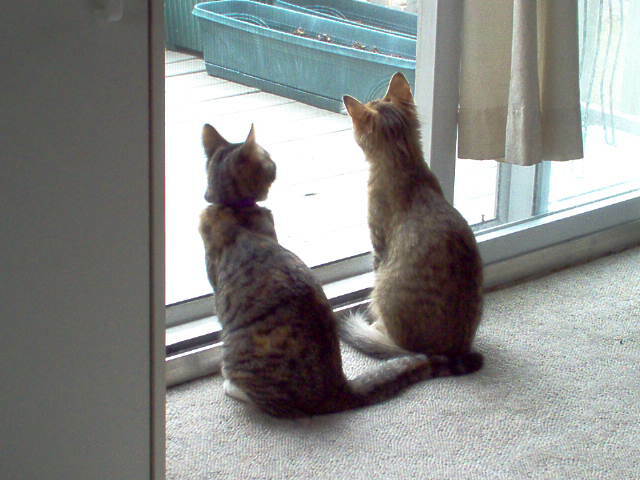 If you are curious, this is Ivy & Spud in March 2009 - when they were only about 7 months old. Edit as of 12/30/10: Mom said that it is for this post only and that she will count all posts through 11:59pm 12/31/10. (and as of right now we have 46 posts and mom almost fell out of her chair). MOL!! Oh is it for comments on this post? 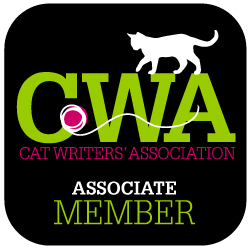 We think this is a great idea - did you let the cat blogosphere know - that will get a lot of people over! And we will let our friends know too! A commentathon is a great idea! Hooray for a commentathon! I always have to remind my mom about stuff, too. That's a wonderful idea and so generous to help the animals. WE came to visit from Amy. I hope you get some more comments. How much longer are you going to have the commentathon and I will be glad to put the info on my post for tomorrow. That looks like a great organization to donate it too. We came from Amy's blog....Good luck with the commentathon. It's a great idea! Oh a commentathon, how fun! We LOVE Comment-A-Thons! And people, two- and four-legged, helping those in need! so count us in! AND we will pass the word! We think this is a great idea!! We will get the word out so you get lots of comments to help the animals!! We heard from Amy about your commentathon. We will put a link on our post as well. Amy from House of Cats has gotten the word out so you should get loys of comments. Thanks to her I now have you bookmarked and can enjoy your site. When my two very senior kitties cross the bridge I plan on doing fostering too. I came from Amy too - I am glad you want to help out this organization! I looked at their site and they certainly have a lot of kitties up for adoption! We saw comments on both Amy and Eric and Flynn's blog about your commentathon, so we thought we would come over and make a few comments. We will put you on our Google Reader and come back for more visits. Saw Robyn's link on Facebook -- great idea!! Yay comments! Our Meowmy saw Robyn's facebook post and here we are! Hope your comment-a-thon is a great success! Followed the linky from Robyn's FB. Much love from Willow and Weedy (the cats), Diamond (the chinchilla) and Pitr (the Russian Tortoise)! I came from Robyn's Facebook page. I think we need a picture of the kitties' faces too. What a great idea! Let's keep those comments coming. And you thought no one would come! Excellent! I like the way Ivy's tail seems to be touching Spud's back, almost like an arm around the shoulders. Very cute picture of them. We are always ready to help out with a comment for a good cause. wandered over because of Robyn's facebook. What an awesome idea! We are here to comment and to say hello! We love commentathons! This is great - thanks to Mom for doing this! 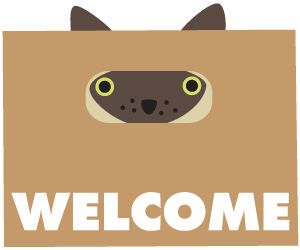 Hi - We came over from Siku's blog. We're glad to be a part of this. Just heard from The House of Cats you were looking for some comments to raise some funds. Good luck with you commentathon. I was told that you were holding a comment-athon to fundraise for kitties. So I thought since I can't adopt anymore cats, I could at least take 5 minutes to help. Thank you for caring for those babies! Siku Marie sent me to wish you well on your commentathon! I am sure you will get lots of visitors. Be sure and let Ann at Zoolatry know, she knows zillions of catz! (By the way I am letting my khat Ali Zophia use my commenter, so be sure and count her! This is Ali Zophia, I am a muted Tortie, very pretty but I am NOT Stella's cat. I am our Mom's cat. Good wishes on your commentathon, I hope you make lots of monies. We don't blog too much anymore, but we will pass the word on. BTW - It's nice to meet you. We were sent over by Eric and Flynn to join in yoor commentathon! Wot a wonderful cause ~ we hope yoo get TONS of comments. purrs, thats gonna be a lot of coins! Me and my Cat Charlie came over from Amy and the House of Cats to wish you all the best with your commentathon and to say a big hello and Merry Christmas and Happy New Year!!! What a lovely idea. Our mum always remembers our special days a week late! We came over from Forever Foster to add our miaows to your commenthaton! Whew, I made it, thought I was gonna be late! Bravo gang!!! What a great idea!! Every idea to help kitties in need is an excellent idea, in our opinions!! Hi, we came over to join your commentathon and to meet you. Glad to see you are meeting so many new friends. Hi! I came over from Amy and the House of Cats. Nice to meet you! Our mom missed our blog anniversary, Fiona's Gotcha Day, she misses everything too. We like the idea of your commentathon. Its a great cause, hope you get lots of comments. Hi! It's nice to meet ya'll. I just want to say that this is such a great way to finish the year up! HAPPY NEW YEAR! Hi there! I came over from Amy and the House of Cats. I'm a dog (hope that's okay) but I live with TWO kittehs and I luvs them OODLES! I think you're doing a super terrific thing by holding this commentathon and I hope you raise lots of green papers. Have you told your mom about it yet or are you just gonna surprise her? Is this a wonderful community or what! I am so proud to be a part of so many that care enough to help! You will find all of these bloggers are amazing! Commentathons are great - hope you have a successful one here. Thanks for doing this! Good luck with the commentathon - will pass the word on! I saw your comment at our blog but couldn't find your email to reply - email me and I can tell you how to follow Daily Dose! Their is a link in my profile. wooowoooo kittehs! That's very kind of woo! We read about woo on white dog's page & just wanted to stop by and paw our names to your list! You cannot have an uneven number of comments! You are doing a great job for the needy...and hopefully meeting a lot of really wonderful new friends! A commentathon is a wonderful way to get more visitors and what a nice thing to donate to. So nice to meet you. Please feel free to come by and visit. Read about your comment-a-thon from the White Dog Army, and thought we'd drop by to participate in this wonderful cause. How generous of you to be hosting a commentathlon! My SS also misses everything in the CB too. We hope you have a wonderful and blessed new year. Thank you for being our friends! We are so happy to see that you are raising so much money for pets who need homes! One of us (Trixie) was adopted from a shelter, so finding homes for pets is very important to us. We just started our own blog. Come visit us! Amy & the House Cats sent us over. Good luck with the commentathon! We are 2 wire fox terriers & 5 rescued cats. Quite the house full. Stop by our blog sometime. I couldn't resist grabbing another .25 out of your mom's pocket. She is an Angel straight from Heaven to be doing the work she does. Come over and see my new babies, adopted from our local shelter. They are 3 months old now and so precious. Happy New Year to all of you there. You are very lucky cats.